Please refer to our stock # B-13 when inquiring. "Yoshitoshi: The Splendid Decadent. The Last Master of Ukiyo-e" by Shinichi Sehi, translated by Alfred Birmbaum. 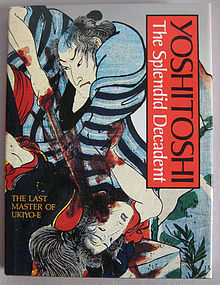 1985 First Edition, Kodansha. Clothbound Hardcover with original dust jacket. Condition - New. 157 pages, over 60 color plates and 80 B/W prints. "That Yoshitoshi (1839-1892) was an artist of rare talent can hardly be disputed. That he was, moreover, the last great master of Ukiyo-e prints is becoming more widely recognized. Yet this recognition has come on the face of a dearth of published material about Yoshitoshi - his life and character, the breadth of his artistic production, and even the reproductions of his prints. The aim of the present book is to fill this gap between Yoshitoshi's growing prominence and the availability of information about him. This book presents the hard facts about Yoshitoshi, allowing the reader to form a knowledgeable opinion about the man and his art." Shinichi Segi is a lecturer at Tokyo National University of Fine Arts and Music as well as Director of the Tokyo Art Institute. He is known for his many publications on Edo-period and modern art.